Chem-Trend® PM-50A is a semi-permanent, solvent-based release system especially formulated for molding operations when a high degree of slip is the primary requirement. 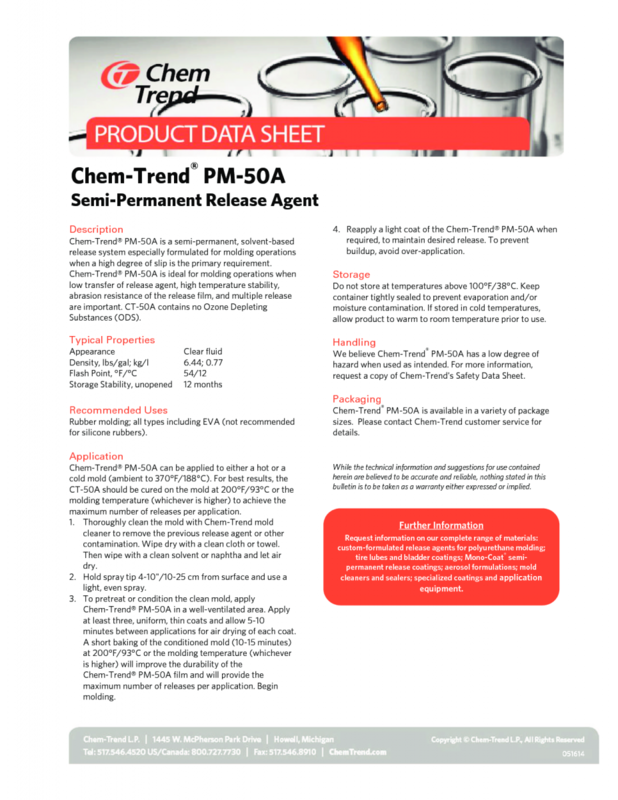 Chem-Trend® PM-50A is ideal for molding operations when low transfer of release agent, high temperature stability, abrasion resistance of the release film, and multiple release are important. CT-50A contains no Ozone Depleting Substances (ODS). Chi Tiết Xem Và Download Tại Đây! Chem-Trend® PM-50A can be applied to either a hot or a cold mold (ambient to 370°F/188°C). For best results, the CT-50A should be cured on the mold at 200°F/93°C or the molding temperature (whichever is higher) to achieve the maximum number of releases per application. 1. Thoroughly clean the mold with Chem-Trend mold cleaner to remove the previous release agent or other contamination. Wipe dry with a clean cloth or towel. Then wipe with a clean solvent or naphtha and let air dry. 2. Hold spray tip 4-10"/10-25 cm from surface and use a light, even spray. 3. To pretreat or condition the clean mold, apply Chem-Trend® PM-50A in a well-ventilated area. Apply at least three, uniform, thin coats and allow 5-10 minutes between applications for air drying of each coat. A short baking of the conditioned mold (10-15 minutes) at 200°F/93°C or the molding temperature (whichever is higher) will improve the durability of the Chem-Trend® PM-50A film and will provide the maximum number of releases per application. Begin molding. 4. Reapply a light coat of the Chem-Trend® PM-50A when required, to maintain desired release. To prevent buildup, avoid over-application.